A couple of decades ago, children were running up the hills, building tree houses and fortresses. They were making tools with what they could find among the trees and they’d mine the earth in search of precious metals. They were creating tunnels and building powered railroads. They were crafting swords and armor to fight off the ghouls that came out at night in search of human flesh. Unfortunately, kids have since lost the desire to wonder through nature and ultimately tame it. Even we as grownups have little time left to explore the wilds. Yet, for those that haven’t heard, a Swedish company has been satisfying our desire in digital form since 2009. I think Minecraft is as popular as the Internet itself. Although this is most likely a gross exaggeration, I firmly believe that if you haven’t ever heard of Minecraft you have been missing out on an important piece of digital entertainment. Minecraft is a sandbox game. That means that unlike most other games that come with strict objectives whether they’re beating the game or reaching level sixty, a sandbox game has no imposed objective. That means that you can either fiddle around the game world or you can pursue your own objective or set of objectives (just as in real life, except here it’s for fun). Minecraft is played through a first person perspective (or third person but that’s not very popular). Your generic character is inserted in a randomly generated corner of nature that can be anything from cavernous hills to searing deserts and frozen archipelagos. Unlike most games these days the graphics in Minecraft are as blocky as a LEGO diorama, but that works to its advantage. Although the terrain and objects look like building blocks, the colors and lighting make them quite charming to the eye. The game play revolves around exploring these landscapes and modifying them to suit your needs and sense of ego. Every block can be broken off, collected and placed somewhere else. Of course this is where crafting comes in. Breaking blocks can be quicker or slower depending on their type. For example going through foliage can be done almost instantly whereas breaking a granite block can take quite a while if you only use your bear hands. To make “harvesting” more effective you will need to craft specific tools such as shovels for digging earth, axes for chopping trees and pickaxes for mining rock. Besides tools you can craft furnaces and burn wood to get charcoal out of which you make torches to illuminate caves and dwellings. This is just scratching the surface mind you. In the latest versions, you can create books, ability enhancing potions and even portals to a type of netherworld called The End. 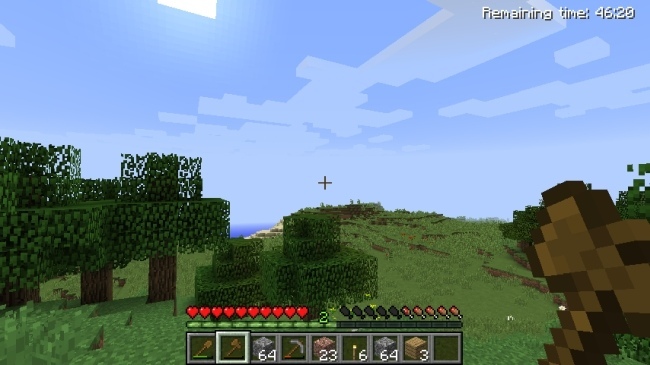 When you start a new world you have the option of playing a creative game or a survival game. The Creative mode is designed to let you experiment with anything and build anything. It imposes no restriction on materials and you can either walk or fly. Your condition in the survival game however is defined by several restricting parameters. There is a day and night cycle. Day time is pretty safe and allows you to explore the surface world in peace. Night time however is very dark and crawling with zombies, spiders, skeleton archers and a host of other monstrosities that tend to gravitate towards your location and have nothing better to do than attack you. Your character has a life counter that decreases every time he takes a fall or gets hit by something. 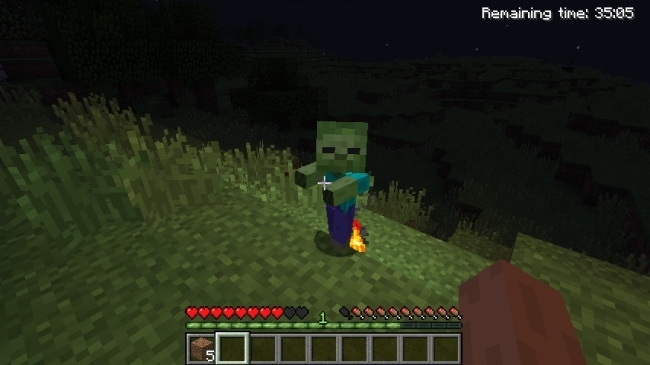 Dying in Minecraft however is only an impediment as you will re-spawn immediately afterwards. Still, having a place to retreat to during the night is probably a good idea. Otherwise you will spend 50% of the time getting chased by arrows and being hacked or blown up repeatedly. That’s why although Minecraft has no goals per se, you will soon prioritize your actions driven by a natural need of security and comfort. A typical survival game will start by you exploring for the best place to make camp and then creating a small shelter in which to retreat for the night. From then on however your ambition will be setting your goals. Do you want a bigger house? Do you want to make an underground lair? Do you want to raise your room above the forest and admire the moonlit valleys from safety? Do you want to erect multiple shelters and link them up by rail-car? Do you want to build a cathedral maybe? You can, because Minecraft is your playground. Minecraft is a perfect escape into the digital realm. It only requires that you leave preconceptions at the door and dive into your sense of exploration, discovery and architecture. A note on the demo version. You need to register an account in order to download the Minecraft client. The demo allows playing survival mode games for up to 100 minutes. You can play as many times as you want but you will always be playing the same world.